Our unique program for children 3, 4, and 5 years of age is dedicated to summer fun, recreation, and development of skills. 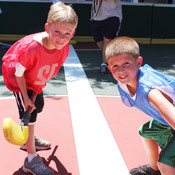 Our program of activities is such that campers always feel a sense of being involved in a true camp experience. It is not just an extension of a nursery school program. While groups remain small and personal, the program steps up to a challenging and exciting level with more advanced swimming and sports instruction, special sports challenges, expanded creative and performing arts programs, and new specialty activities and special events. 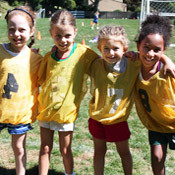 For campers going into 3rd and 4th grade, the regular program of swimming, sports, and specialty activities is enhanced and made more challenging. This program is highlighted by swimming in our Olympic-size swimming pools, expanded sports leagues & tournaments, advanced creative arts programs, evening theater performances, out-of-camp activities, horseback riding, golf program, color war and our sports specialization programs. For campers going into 5th, 6th and 7th grade, the regular program of swimming, sports, and specialty activities is enhanced and made more challenging. 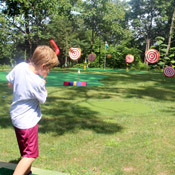 This program is highlighted by swimming in our Olympic-size swimming pools, expanded sports leagues & tournaments, ceramics & pottery, evening theater performances, out-of-camp activities, horseback riding, golf program, optional mini-sleepaway experience, out-of-camp day trips, indoor tennis and our sports specialization programs.